Get a taste of 'Fight the Century' in this teaser trailer and preview images – AiPT! Mayweather vs. Oscar De La Hoya! And now…Rex Punga vs. The World’s Most Evil Corporation! Rex Co. Comics is proud to present the latest chapter in FIGHT OF THE CENTURY, a sci-fi maxi-series set in a futuristic Brazil where performance-enhancing drugs have gone from behind-the-scenes banned substances to front-and-center game changers. The sports world as we know it has been revolutionized! 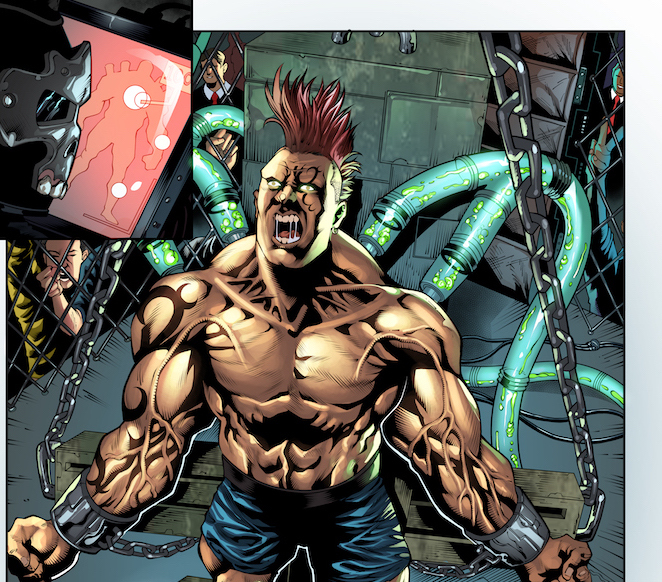 FIGHT OF THE CENTURY #1 introduced readers to Brazilian MMA fighter, Rex Punga. A nationally disgraced mixed martial artists who saw his fight career end before it truly started. All because of the latest and “safest” designer drug. Now, with FIGHT OF THE CENTURY #2, Rex has cleaned up his act and will be forced to blaze a comeback trail. That is unless BrawnPharm – the evil pharmaceutical corporation that has drugged all of Brazil into compliance – doesn’t stop him from exposing their nefarious bottom line! In a world where everyone pops pills to fix their problems, can Rex prove that nothing beats skill? Can he punch, kick, and fight his way to the truth? Will he be able to salvage his marriage, his family name, and his own sanity? And how can he climb the ranks of the MMA world when his opponents are all hulked-out behemoths? With influences ranging from ROCKY to AKIRA to FRANKENSTEIN, you won’t want to miss this comeback story where “David” meets Goliath” in the Octagon! You can find out more about the story of FIGHT OF THE CENTURY, by visiting the official Rex Co store on Shopify. And, if you missed out on issue 1 and would like to also read issue 2, you can pick up the “Prestige version” of FIGHT OF THE CENTURY containing both issues for the price of one! Get a taste of more from Fight of the Century below.